Chandrima Chatterjee, co-founder and director of Street Soccer Philadelphia, is a sports and social change program developer, event manager, promoter, digital media specialist and curator. She is the social media director and interim communications manager of Street Soccer USA. Her background in public health, biology and community management for various political campaigns across the nation, contribute to her unique ability to assess and address issues that global and national nonprofits face in a methodical manner. She has worked with sports for social change NGOs across the world. She is also occasional writer for Brown Girl Magazine, Corner of the Galaxy and editor/director/writer/photographer for Women United FC, a women’s media group covering soccer in North America and beyond. Her ultimate goal is to bridge the gap between the sports outreach/NGO space and the professional sports networks. By working together, an optimal sustainable and accessible social change and growth environment can be achieved. Asked, how did you get to where you are today? It was one fortuitous evening while in graduate school that I happened to stumble upon a move called Kickin It. It showed a world where sports had the power to impact poverty, homelessness, educational deficits, women’s and girls’ rights, barriers to health, child marriage and human trafficking, all over the globe. It was love at first sight. I signed up for the 2009 Homeless World Cup in Milan, Italy as an international volunteer the next day, which happened to be their final day of applications. It was meant to be. I have never looked back. The rest has really been constant networking, raising social awareness in various mediums and working with as many organizations as possible to constantly challenge myself and grow by learning from others. We have so much to offer each other as a global community. What’s been lacking has been the constant communication, but that is slowly changing. Chandrima shared a recent story of how her work has impacted the industry. There’s a huge need to connect athletes, celebrities and other influencers to causes and organizations that they care about and have a direct personal connection to. Often they are unable to do the research on their own, or through their agents to find authentic and credible matches. By integrating a real interest, even if it’s just a seed in their mind that hasn’t yet taken shape, into a campaign they can get a true handle on, the impact is far greater than if you force an unnatural connection. Often the larger NGOs get more than their share of promotions and awareness campaigns, but a lot of the amazing work that’s being done around the world is by smaller non-profits that focus exclusively on programing and not on PR. That means there are tons of connections that can still be made, and millions of people who can still be empowered. C2 Media, which I founded last year, is basically about transforming this process into one that both parties feel empowered by, while teaching tools that are translatable to post-campaign situations. Event promotions, management, fundraising and social media for social good are the heart of what I do daily. Connecting the smsports powerhouse Tagboard to Street Soccer USA, and watching people’s hearts uplifted at SSUSA events is one of the most recent highlights of this summer. Social media is a tool for a lot of the softer, but much-needed social work, and it’s helped bring our SSUSA community (which spans across the country in 16 cities) together. Our players often use social media to reach out, check in, ask for help and support. It’s never going to replace a face-to-face exchange, but it is the next best thing. And being there for each other no matter what is what I think makes SSUSA’s social media setup different. There’s a huge potential out there for social media networks as a tool for mental health support. We’ve barely hit the tip of the iceberg. Since Chandrima is an avid soccer fan and does a lot of work in this space I asked what her thoughts were on the media coverage for the 2015 Women’s World Cup. Coverage in the U.S. of the 2015 Women’s World Cup was phenomenal. It was a real convergence of networks, traditional media, innovative social media, star quality players, powerful underdog team stories and the ratings to boot a win for the USWNT. The TV ratings for the WWC2015 broke records for soccer of either gender in the U.S. and better than ever in Japan, Canada and France. Fox was the broadcaster for the Women’s World Cup, and set a record for the most-watched soccer match in the U.S., men or women, with the USA’s 5-2 win over Japan in the final. The match posted a prodigious 12.9 household rating/share with 25.4 million viewers, and peaked at 30.9 million. EspnW pulled a record 8.1 million unique visitors in April and, almost matched it in the traditionally slow months of June (7.8) and July (7.4). It led to 65 million other unique June visitors to the rest of ESPN digital, which almost exclusively covers men’s sports. Though these are positive indicators, there’s still a long way to go: continued growth in attendance, media coverage and corporate sponsorship will all play crucial roles in the trajectory of women’s sports coverage in the U.S. where media coverage of women’s sports runs between 2 to 4 percent of total media sports coverage. There’s a lot of work to be done, and half the battle is continuing that WWC high from the mid-summer, competing with the male-dominated sports coverage makes it all too easy for the casual fan to overlook women’s soccer for another four years. Hopefully that doesn’t happen. But it means keeping it in the conversation and mainstream media. Lastly, I asked her to tell me more about Women United FC. I’m the current director and editor of Women United FC, dubbed WUFC 2.0. Basically Women United FC began as a forum for conversation, learning, promoting and discussing the beautiful game of soccer for all women, and has been transforming into both a platform for fans of the game and for aspiring media professionals to practice their craft. All soccer topics are on the table. All leagues are open to discuss. We’ve covered MLS, WWC, EPL, USOC, Politics & Soccer, International Players, Female Soccer Players, Fan Profiles and we’re just getting started! We’re a fun group too – hosting events around the country that will bring together the WUFC community and the soccer world around us. WUFC 2.0 is one of the many ventures I’ve chosen to promote and work with from the inside-out. And yes, the obvious question is when will you start promoting the Women’s Game – my answer is, as soon as we can recruit women who are ready to create content around it! Thank you Chandrima for taking the time and telling us about your story, your love for soccer and more! Follow her on Twitter at @chandrimatweets. There are more South Asian women in the sporting industry than you’re probably aware of. My article featuring these five in Brown Girl Magazine. Listen in as they talk about a wide range of sports topics including violence on and off the field, Ronda Rousey, and more. Want to know more about Hard Knocks and how it’s filmed? Here’s a great behind-the-scenes take by Tania Ganguli (ESPN NFL Nation reporter), http://espn.go.com/nfl/story/_/id/13416034/houston-texans-hard-knocks-hbo-scenes. 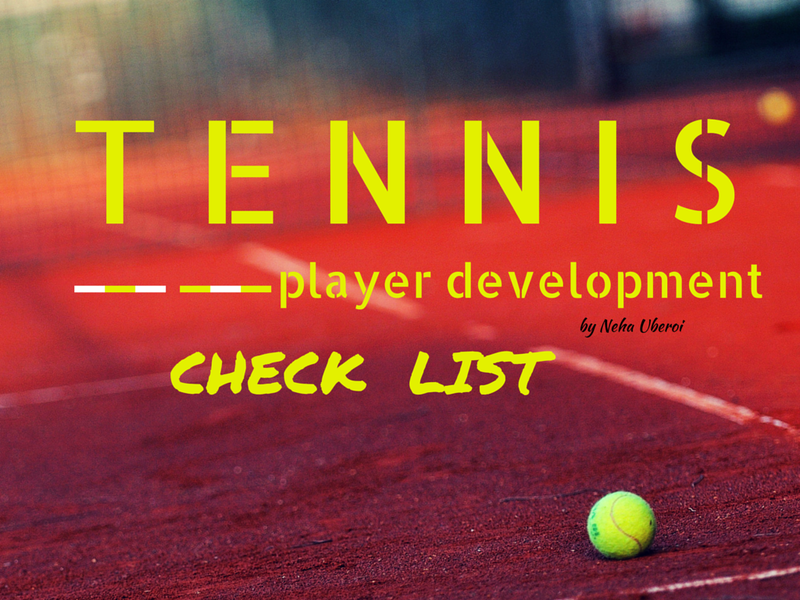 Check out Neha Uberoi’s tennis development checklist by clicking here. Doha GOALS is a forum to bring together world leaders and youth to discuss problems surrounding areas such as: social inclusion, diversity, education, children, health and beyond. The unique nature of this forum is to not only discuss social issues but to also come up with solutions to address problems through sport as a tool for social change. This year saw the successful completion of the 4th edition of Doha GOALS at Los Angeles. The entire conference lasted four days with activities for student ambassadors, interesting panels and renowned guest speakers. The day before the conference there were fun activities for the students, a 5k run and a friendly soccer tournament. The first day of the conference featured many guest speakers including, Janet Froetscher CEO, Special Olympics, Daina Shiltz, Athlete, Snowboarder. The speakers spoke extensively about the Special Olympics and shared some personal stories that inspired the audience. Following this, we all headed to the Coliseum to watch the opening ceremony of the Special Olympics. There were great performances by leading stars, including Avril Lavigne, Eva Longoria and Tim Harris, to name a few. The highlight was definitely the sheer number of athletes who had gathered from various countries to compete in the World Games, it was truly an inspiring moment for everyone in the audience. The First Lady, Michelle Obama declared the games open, which was followed by beautiful fireworks at the Coliseum! The second and third day of the conference primarily consisted of panels and guest speakers including Michael Phelps, 22-Time Medalist and Travis Pastrana, Global RallyCross Champion. The student ambassadors were engaged in six taskforces surrounding topics such as Diversity in Sports, Solving big problems through Philanthropy, Sports and Social Good, Diversity and Inclusion, Partnership for Good and Sports and Social Entrepreneurship. The students were asked to come up with innovative ideas to address some of the issues around sports. These ideas were then collected and/or presented to the judges. Feasible ideas were given further consideration for implementation. While this was one of the ways in which students were given a platform to present their ideas, they were also invited to propose projects involving sport for social good. From the many proposals the organizing committee received, four projects were selected to be presented in front of the judges and secure funding from the Doha GOALS Foundation. The conference was officially closed by Richard Attias, Executive Chairman, Richard Attias & Associates. 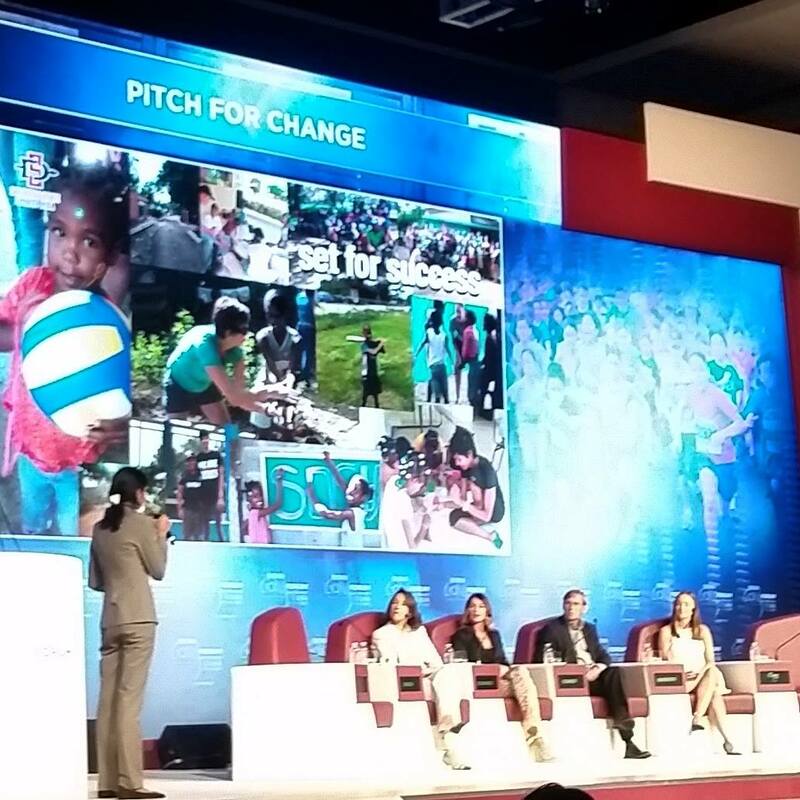 Rekha had the honor to present her idea on using sport for social good, in particular using volleyball as a tool to get women and girls to be more than a wife and mother. So inspiring!! Check out her full presentation starting at the 22 minute mark. For this month’s chat we had another featured guest, Kavitha A. Davidson who is a sports columnist for Bloomberg View. I thought it would be a good chance for not only Kavitha to interact with other South Asian women in the sports industry but also for other folks to learn more about her experience and impact. We also co-hosted this chat with Brown Girl Magazine who are dedicated to providing a voice to South Asian women. I see it as being a platform for opportunity, a platform that empowers success. Check them out when you get the chance, www.browngirlmagazine.com. The conversation started off with learning about Kavitha and how she got to where she is today. When asked about what types of struggles she had along the way and how she overcame them she points to taking advantage of what’s in front of you. I could not agree with her more because many times we’re looking for a big break but that can’t happen over night. There are many tools and people we know that can assist us along the way but a lot of times we don’t even think about it that way. We went on to ask Kavitha about breaking into the industry as a South Asian and here’s what she had to say, from a sports columnist perspective. So as we continue to try to grow this network and platform for South Asian women in the sporting industry Kavitha had some great thoughts. We also learned that Kavitha most recently attended the espnWsummit where folks come together and create change and opportunity for women in sports. We asked Kavitha what her role was and to tell us about the summit. These types of platforms can aide in advancing South Asian women in the industry, it would help us continue to network which ultimately builds out a community. We asked Kavitha what her thoughts were on mentorship and what’s great about her answer is it’s real. We need mentors but don’t close yourself off to who those can be. For those in the industry, don’t forget to pay it forward and mentor someone else, pave the way for those next in line. How, you ask? Of course to succeed in anything in life, it’s important to have support from family, friends and colleagues, something Kavitha sees as a plus at Bloomberg View. When it comes to sports writing one may think, how can someone possibly think there are any difficulties that come with it? You are doing what you love, right? Well, Kavitha makes a good point here. Then of course there are the rewards from writing about sports, especially the angle Kavitha brings. Here’s what she had to say regarding the best part of her job. So, you think you want to be a sports writer? Here’s some of Kavitha’s advice. Something we can all learn from Kavitha is once you find your passion, stick to it and continue to have an impact. She brings a unique side to sports writing, has found her niche and will continue to make an impact in this space. This field is still regarded as “not mainstream” and something we all need to continue to do is keep the lines of communication open. Continue to network and engage with folks, that’s how we’ll grow this community. We’ll leave you with Kavitha’s final thoughts. It was great chatting with Kavitha about her experiences and how she’s made an impact in the industry! She has a lot to offer and is a role model for those next in line. Let’s continue to network and build a platform for all South Asian women in sports. Thanks Kavitha for spending that hour with us sharing your thoughts and experiences!